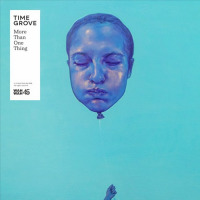 Tel Aviv band Time Grove offers all the above options on their debut record More Than One Thing. Based around the work of acclaimed pianist Nitai Hershkovits, the group employs synth-savvy artist Rejoicer from those delicious funk-tripsters Buttering Trio. Also on board for this cyber-jazz ride is reed player Eyal Talmudi, whose twelfth birthday gift was a saxophone made in Harlem, circa 1931. Guitar, trumpet, more keys and a drummer complete this thoroughly modern outfit. The cover artwork intrigues, with a human head-balloon being set free or kept tethered. Whether it's a comment on political or internal reality, or neither, our attention is secured. The opening cut "TG Theme" does likewise, making for a noirish intro of jagged sax and prowling keys. "Second Attention" is named after a shamanic state of awareness and suitably offers a spacious ambience. Piano glimmers, snicking percussion and electronica make for a world of energy and spirit. Quite what "Jungle Bourjois" means is up for grabs, but Sefi Zisling's trumpet purrs a sweltering phrase to cherish. The gently ambling "Indopia" (now there's a title) sprinkles beats with digital dust, eastern folk and haunting woodwind. Talmudi's flute blows more quiet prayers from its every cavity on "Piano Bubbles" among digi static and breezy keys. Snippets and samples break into several tracks, including the blissed out "Talek" and "Nezach." Likewise on "Sir Blunt," where we might be tuned to an astral jazz broadcast from some wonky satellite. Desert funk spins "A.L.P." into a surreal head trip, then "Roy The King" (drummer Roy Chen was anointed thus by the band) finds an energised seethe. "Latrun" closes things out with a brooding motif, like some calm invocation. The number is named after a hilltop overlooking the road between Tel Aviv and Jerusalem, where fighting occurred during the 1948 war of independence. Not all Israeli artists hint at their homeland's unrest, but this album sends a statement from young creatives, confident in themselves, whose musical freedom knows no authority. More Than One Thing is the sound of something lasting, built from human goodness. Track Listing: TG Theme; Second Attention; Jungle Bourjois; Indopia; Piano Bubbles; Sir Blunt; Talek; Nezach; A.L.P. ; Roy The King; Latrun. Personnel: Nitai Hershkovits: piano; Rejoicer: synths; Eyal Talmudi: reeds; Roy Chen: drums; Amir Bresler: drums; Sol Monk: drums; Bemet: keyboards; Sefi Zisling: trumpet; Yonatan Albalak: guitar.